As someone who has long held a passion for sports and superbikes, the TT Isle of Man race is something that I have to confess to being enthralled by. In my early twenties I became the proud owner of a Honda CBR500R. It wasn’t the biggest or scariest bike out there, but it was fast, sleek and sophisticated. It was so fast in fact, that it wasn’t possible to legally put it through its paces. That’s why the TT Isle of Man race is so captivating for me and many other bike fans, as it brings together some of the finest two-wheeled monsters out there, before pitting them against one another in one of the fastest street circuit races in the world. The 37-mile long circuit is full of open straights, narrow roads and daring corners, and it allows us to truly see the real capabilities of the wonderous machines as they reach those breakneck speeds in all their natural glory. But can the official game bring that same experience to the gamers out there? I jumped in to TT Isle of Man: Ride on the Edge to find out. The guys tasked with bringing us the latest official racer are none other than experienced racing developers Kylotonn, famed for the development of the WRC series. Whilst they may not be synonymous with bike racers – that’s usually Milestone – it’s fair to say that for an officially licensed bike game, or just anything that isn’t WRC, Kylotonn have provided a rather exciting experience and one that I thoroughly enjoyed. But it’s not without a couple of glaring hiccups which can’t go ignored. So, the game starts off with an optional tutorial, and whether you’re a veteran racer or just a newbie stepping in for the first time, the tutorial is something you really don’t want to miss. It’s not that it’s overly spectacular, in fact, after getting past it and onto the main game, I felt it had only taught me half of what I needed to know, but it does still provide a basic way to get to grips with the high-speed racing and sharp cornering. From there on out, players are given the option of Solo, Multiplayer and Leaderboards options from the main menu. Solo brings the Quick Race, Time Attack and Career options, whilst Multiplayer brings Online and Offline. It’s a rather limited menu screen but it gets the job done. 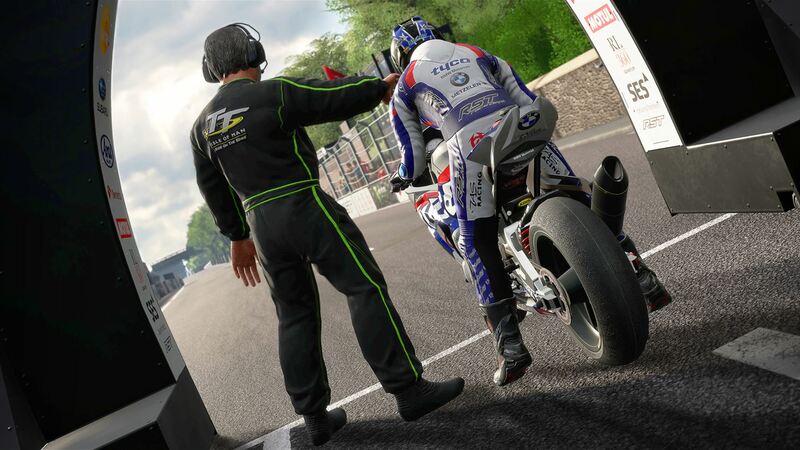 For many, the thrill of the ride is going to be all about the Career mode and after creating your rider and choosing the bike you’re going to buy from eight different manufacturers, you’re ready to start your career. My initial £40,000 budget went towards the purchase of a Honda CBR600RR as I looked to stay as close to my comfort zone as possible, but other options include the BMW S1000RR, the Kawasaki ZX-6R and the Yamaha YZF-R6, amongst others. The next stop is the Career Hub. Here you can check emails and messages, browse the bike collection – you’ll be buying multiple eventually – shop for new ones and view your upcoming calendar. I’m not fond of the Career Hub though. Whilst it works, it isn’t the easiest thing to get on with. Messages and emails come through in a rather untidy fashion by throwing them all at you in a disorganised list, when all you want to do is use these to accept your next career event, whilst the calendar is a little pointless given the only thing you can do is check your next event that you just agreed to within the messages. It is certainly not as smooth as it could be. After you’ve accepted your event – which will be within either the Supersport or Superbike category – you’re ready to begin. How far you get to becoming the champion however will depend on both your patience and skill. 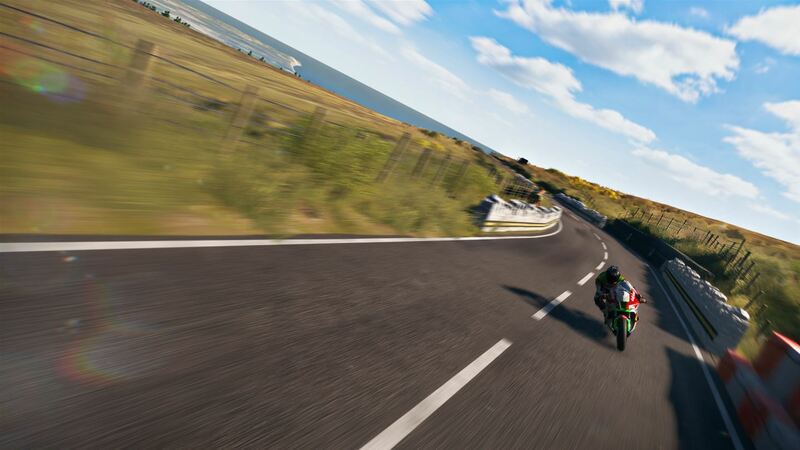 Throughout the Career, players will race on a number of different tracks, with some tracks containing wide open roads, and others taking you close to the sea. Now, before we go into anything negative, I need to mention a few striking positives. The first of which is just how amazing the visuals are within TT Isle of Man: Ride on the Edge; they are superb. From the official riders and bikes, to the perfectly recreated tracks and environments, this is a game that certainly looks the part and by god is it a wonderful sight to see, even when racing the way it was intended – at 200+ Km/h. Unfortunately though, there is one glaring issue that’s present… the collision system. No matter whether you’re putting your bike through its paces on the 37 mile-long Snaefell Mountain Course with a staggered start, or trying to navigate the awkward and unexpected turns of the Antrim Speed Track in a mass start, there’s one thing that’s for sure – you’re not going to be staying on your bike for very long and that’s because of the overly sensitive collision system that is in place. Now before anyone jumps in with criticism, I’m fully aware of just what could happen with the slightest bit of unbalancing to a rider pushing speeds upwards of 200Km/h, and I’m well aware the slightest knock on their bike could ensure they go plummeting into the closest wall. 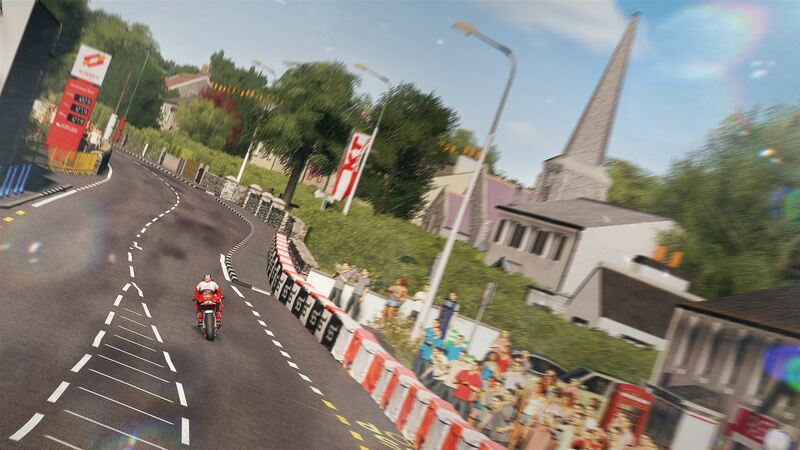 That’s what makes the TT race so exhilarating, but that doesn’t mean I want to spend every five seconds grinding my face across the tarmac when I step into a game. Unfortunately, that’s exactly what happens. It’s not a case of poor ability either. I’m not one to boast but as someone who frequents the MotoGP titles and loves to get stuck in with the many bike racers that have appeared over the years, it’s fair to say I know when a mistake is my fault, and pushing on the brakes ever so slightly should not see my bike quickly losing control before sending me over the handlebars and the bike off down the road. The feeling of losing control of your bike during a race is an infuriating one, mostly because it can happen for any number of reasons. If the overly aggressive A.I. opponents bump into you, chances are it’s race over. Power out of a bend, race over. Find a bump in the track in which your wheels leave the surface for a brief second… yep you guessed it, it’s most likely race over. 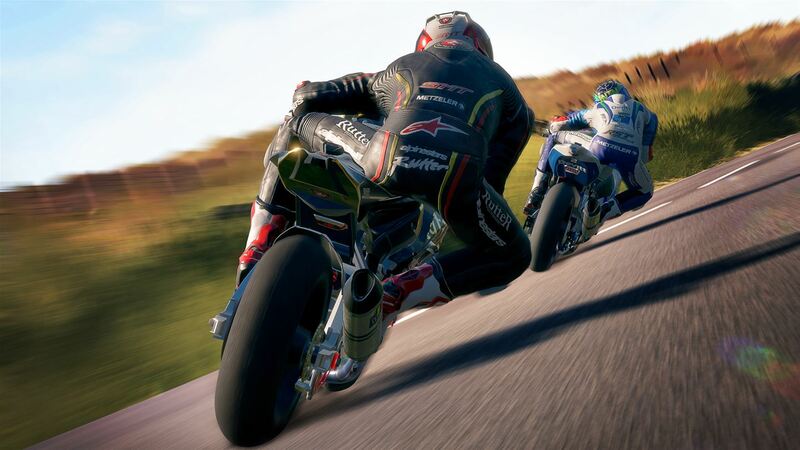 Why, well because not only does TT Isle of Man: Ride on the Edge come with one of the most shockingly sensitive collision systems seen in a racing game, but it also comes missing one key feature that has become a mainstay in racers over the years, one I haven’t always enjoyed but that would suit this game perfectly. A rewind feature. See, if you think you can just go back a few steps and try and prevent that issue fifteen minutes into a race then think again because your only option is the wonderful ‘restart race’ option. When the main TT race can be well over 30 minutes long, that surely must be some massive oversight. Something else that makes the collision system even worse is just how unrealistic the crashes actually are. Whilst I’m not going to sit here and say we should see the bikes smash to pieces and riders killed in a ball of flames, I certainly don’t expect to see bikes bouncing before landing like a brick either. No matter how many times I ended up on the floor, there wasn’t one occasion in which my crash looked or felt either realistic or fair. Another issue that presents itself is just how basic the Career mode is. Sure, you have the option to buy various official bikes, but other than that, there is very little way to bring any real customisation or personalisation to the Career experience. After creating your rider, there’s no longer the chance to edit anything about him, there’s no way of changing rider gear, or colours, or anything that would help mould the rider in general. In the grand scheme of things, it’s nowhere near as much of an issue as the over the top collision system, but it’s one that I noticed quite early on and it would have been nice to have at least seen some official rider gear to unlock and buy to change things up a little. Back to the game modes though and moving away from the Career mode, players can jump into Quick Race or Time Attack in Solo play, or Online and Offline options for multiplayer. None of these modes really bring anything in terms of surprises. Quick Race is a meaningless one off race on the track of your choosing, and Time Attack sees players try to post the best possible time on any given track. Pretty much as you would expect of each to be honest. In the Multiplayer scene, we see Online allowing a race against others via matchmaking, with Offline bringing together up to eight players as they take turns to compete in a staggered run event in which the positions are based on overall times. All of the modes work as intended, but there’s nothing of real value within any of them and it’s by far the Career mode that will keep you playing. If you look away from the crashes and the disorganised Career hub however, and in terms of simulation, it’s possibly the closest we’ll get to an accurate showing of the sport. The visuals are spot on, the bikes feel amazing, the weight is perfect, the sense of speed is unparalleled, and cornering is unbelievably accurate. 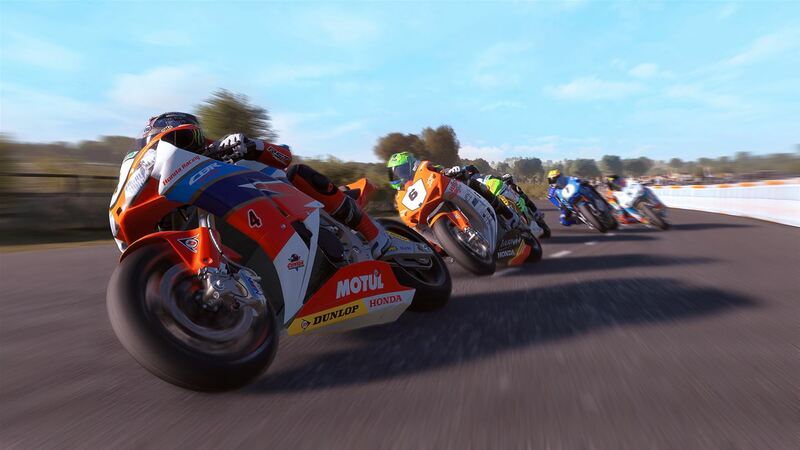 But unfortunately at this moment TT Isle of Man: Ride on the Edge is a game that is failing its players in the areas that it should really look to excel, and there are some desperate changes needed to bring this game up to the standard it deserves to be at. Next articleRobocraft Infinity Xbox One Public Beta announced!